Welcome to the November edition of my Games Focus newsletter, I hope you enjoy it! Games Focus is sent out once a month, and will save you the time and effort of trying to find great games by bringing you a "Game of the Month" review. The newsletter also has one preview of a hotly anticipated game that's about to be released. This is always an exciting time for game fans, as publishers release their blockbuster games in time for Christmas. Call of Duty Modern Warfare is as hot as it gets and it's coming to the Wii this month. I played the original Modern Warfare when it was released two years ago, and trust me when I say it is one of the best games I have ever played! Mini Ninjas is a non-violent action adventure game that's aimed at younger gamers, but the pure charm of this game makes it a must-play for all ages. When the Evil Samurai Warlord kidnaps forest animals and turns them into an evil Samurai army using Kuji magic, it falls on a young Ninja named Hiro to save the world. As Hiro journeys through beautiful Japanese landscapes, including villages, bamboo forests, canyons, and castles, Hiro must defeat the Evil Warlord's Samurai army and restore peace to the world. If you are that someone, you can get your very own subscription and FREE Wii book by clicking on this link. The explosive Call of Duty: Modern Warfare was Game of the Year when it released on the Xbox 360 and PS3 consoles two years ago. Finally Wii owners will get the chance to experience one of the most intense action video games of all time when Call of Duty: Modern Warfare is released for the Wii later this month. 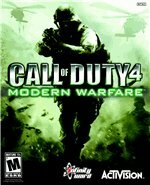 The Wii version, called Call of Duty: Modern Warfare Reflex, will include every level from the original version, and has not been cut down in any way. Read more about the single player campaign and awesome online multiplayer modes that continue to keep Call of Duty: Modern Warfare on top of the online play charts two years after it was first released on the other consoles. Thank you for reading this edition of my newsletter, I hope you enjoyed it. If you would like to give me any feedback, please feel free to drop me a line. Join me again next month, I promise to have another great game reviewed for you. I'm busy playing through it at the moment, and it's topped the charts around the world – I know you'll enjoy it.